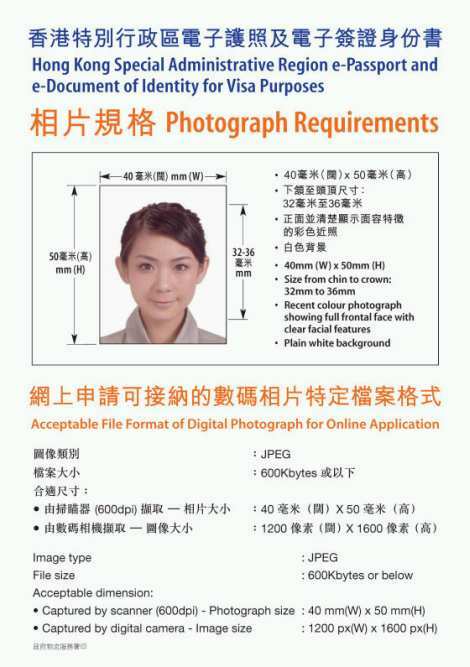 A photo needs to abide by very strict specifications if you want to use it in your Hong Kong passport. Fortunately, it’s easy to get the kind of photo you need with My Passport Photos, since we have a great deal of experience helping people from Hong Kong take their passport photos and know what they need to include. You can find all the information you need and take your picture quickly with our service so that your passport is up to date and complies with all legal requirements. Before you go anywhere with your passport, you’ll also want to use www.ivisa.com to make sure you don’t need a visa for the country you’re visiting. Don’t worry if you do, though—many visas can be processed online, a step made considerably easier by using iVisa to check beforehand. Head size and position: Facing forward and squared with camera. Head should measure 32mm to 36mm. Background: White and solid. No patterns or colors. Smile: Natural smile is acceptable without showing teeth. Otherwise, neutral expression. Glasses: Only if eyes are not covered. Dimensions and size (pixels): 600Kb maximum. 1200x1600 pixels. Attire, clothing, dress code: No dark or white colored clothing. Avoid thick make-up. Quantity needed in application: 3 for passport. 2 for visa. Clothing is rarely an issue except when you wear a white top. This blends with the background and doesn’t give a distinct differences between you and the wall. Ladies, avoid wearing too much make-up. Your natural face will do just fine. Men, if you have long hair, it must be tied behind your head. Beards are almost never specified, however, if you wear one normally, it’s acceptable in the image. Smiling is not recommended but isn’t prohibited. A small, crease of the lips is OK so long as it doesn’t distort the face. Eyes are always the focal point of any passport or visa photo. Therefore, they should be open and not blocked by any object such as glasses. Sunglasses, tinted lenses or glare are not permitted. If your glasses have thick rims and block your eyes, kindly remove them for the photo. If you are scanning a picture into the computer, be sure it’s 600dpi and JPEG format. Hats or other headwear are never allowed unless it’s for religious reasons. If religious, it cannot block the face at all. Improper lighting is the most common reason for rejection. Be sure there are no shadows on your face or background. Also avoid photos which are too light or too dark. Be sure your head is squared and facing forward with the tops of your shoulders in view. Photos must be printed on glossy, high quality photo paper. If you are holding an infant, make sure you’re not visible. Drape a white cloth or sheet so the background is solid. This can also be done if lying the child on the floor or in a car seat. Toys, blankets or pacifiers cannot be visible. The child’s eyes need to be open and mouth closed. It may take a few tries before this is accomplished. Be sure the infant’s head is centered and looking directly at the camera. Check lighting. It should be evenly distributed through the image and not reflected on the background. Having all the information you need is only half of getting it completed. Now you must decide where you wish to finish the photos. Prior to Internet conveniences, if you needed a passport or visa photo, you had to fight traffic jams. Post offices or drug stores are generally the ideal places to have these pictures taken. But who has time for that? Life is busy and downright crazy at times. Choosing to partake with a trusted website such as MyPassportPhotos.com can help cut down wait time and cost. If you chose to have photos done at a post office, be prepared to pay about 116 HKD per set. On the other hand, we can take care of you for 49 HKD. Plus, if you need additional photos for you or your family, the price goes down. That’s a deal if you ask us! At MyPassportPhotos.com, we offer easy to use services which allow you to take care of business in a timely fashion. The above specifications are taken care of by our knowledgeable staff. All you need is a smartphone or tablet, white background and our passport photo booth. Snap the picture and submit from the comforts of home or work. We offer 100% government compliance before submission. Should you be unhappy with your photo, retake as many as you like until you are satisfied, free of charge. If questions or concerns arise, give us a call 24/7. You also have the option of in store pickup or immediate download. Whatever you chose, give us a chance to get you going and exploring the globe quicker!